Roger Mayer is a British audio designer probably best known for his work with Jimi Hendrix where Roger helped create his unique ground-breaking sound in the late 1960's via hand made custom pedals, compressors and outboard equipment. Roger started off making guitar effects for Jimmy Page, Jeff Beck and Big Jim Sullivan around 1964 and his fuzz pedal designs lead him to meet Hendrix and design the legendary Octavia pedal which was used for the first time on the Purple Haze guitar solo at Olympic Studios, London. From his inital work with Hendrix, Roger became so integral to his sound that he toured and stayed with him throughout his recording process and performing career. After his time with Hendrix Roger designed recording consoles, limiters and equalisers for many studios in New York and throughout the USA leading him to work with Stevie Wonder, designing him a custom synthesizer, also working with the Isley Brothers for seven albums and Bob Marley. His unique approach to audio equipment design allowed Roger to start developing a new tape technology simulation for use in modern DAW systems. He felt the classic sound of tape was what was missing in some modern recordings and this box first became available in a limited run of half rack processors called the 456HD®. 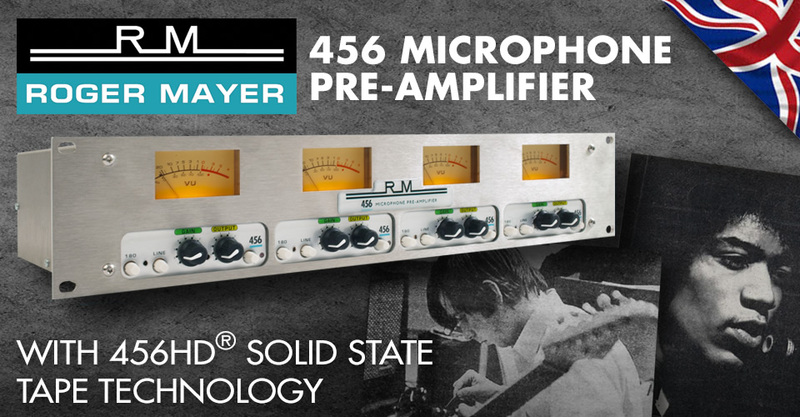 This 456HD® Analogue Tape Simulation process is now available for the first time within a new range of Roger Mayer Class A discrete mic preamps. These pre-amps are his original designs from 1968. These pre-amps feature UK hand-wound balanced ferrite transformers and coupled with the 456HD® high speed analogue dynamic process can act like a solid state tape recorder when recording into your DAW, or when reprocessing via line-level connections. The 456HD® Analogue Tape Simulation process is based upon a perfectly line-up Studer A80 with 456 Tape.